The fragmentary remains of a medieval priory church, probably 12th century, partially obscured by vegetation. A broad range of Roman, Saxon, medieval and post medieval objects have been found on the site since the 19th century. Other finds include a Mesolithic microlith and a very rare Middle Saxon spur. This is the site of a Benedictine priory, founded at an unknown date. While the priory was transferred to Thetford in 1176, the nuns remained on site in 1250, perhaps as a grange (S1). The Prioress of St George's Thetford held a fair at this location in 1287 (S2). 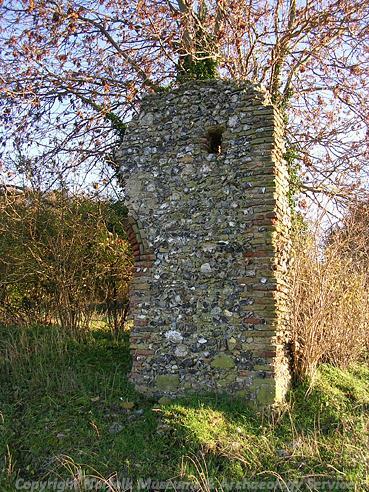 By 1730 (S3), the ruins of a chapel are described, called St Edmund's Chapel, and the nunnery could not be found. The name St Edmund's Chapel is continued on the Ordnance Survey map (S4). H. Hamilton (NLA), 21 January 2008. 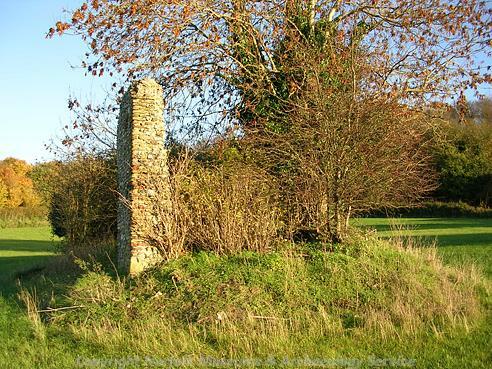 Several human skeletons were uncovered between the chapel and the King's Wood to the southeast (now marked on Ordnance Survey maps as The Grove). A chalice was also reportedly found, but has since been lost. E. Rose (NLA), 7 March 1995. A censer found near the site of the chapel. It is now in the Fitch collection in the St Peter Hungate Museum. It is possible that this item had been confused with the 'chalice' reported to have been found with the burials. Information from (S2). Also see (S7). A base sherd of Middle Saxon/Late Saxon pottery was found. It has been described as Thetford Ware. A late medieval chamfered brick was removed from the north door as a sample. This is the arch with brick enforcement noted by Pevsner (S5) and north doorway described by (S3). The fieldwalking revealed a spread of medieval pottery sherds across the field, but concentrated along the north edge of the slope to the river. Two sherds of Roman pottery, Middle Saxon pottery, and an undated copper alloy object, possibly a harness fitting, were also found. Fieldwalking in the northeast portion of the field after ploughing yielded 3 flint flakes, 4 Ipswich ware sherds, 13 medieval sherds, 5 post medieval sherds, a fragment of a lava quern, one Romano-British box tile, one imbrex, and an undated iron knife-like object. See details and x-rays of knife in file. A Late Saxon pin and Middle Saxon coin were found in the northeast of the site. A Middle Saxon pin was found south of the chapel. A Late Saxon mount was found in the eastern half of the field. A Middle Saxon pin and a medieval key were found. November 1999-February 2000. Metal detecting. . Early Mesolithic microlith (obliquely-blunted point). See description and sketch by P. Robins (NCM) in file. Three Roman coins, a Middle Saxon Ipswich ware sherd, and mdieval and post medieval metal items were recovered along with an important, complete Middle to Late Saxon prick spur similar to that in (S6). A post medieval coin was also found. K. Hinds (NLA), 8 March 2000. Late 1999. Metal detecting. .
Further description by  of object previously recorded and found by  in January/February 2000 (Late Saxon spur). K. Hinds (NLA), 11 October 2000. Late Saxon copper alloy spur, (S8). March-April 2000. Metal detecting. .
1. A medieval belt or harness fitting, sexfoil with one opposing pair of foils straightened off at their outside edges. Two separate long rivets. Length 45mm. 2. A post medieval ball-headed pin. Hollow gilded ?silver head with filigree spiral decoration; short collar with filigree bands above a silver 'sleeve', very narrow shank of uncertain metal passes through 'sleeve' and into collar. K. Hinds (NLA), 8 June 2000. A medieval copper alloy key was found. The shank and bow are cast in a 'kite-shape' with an ovoid opening. It has a simple bit with an L-shaped section. Identified by S.J. Ashley (NLA), November 2000. Two Roman coins, five medieval coins (including a Stephen), a Middle Saxon pin, a medieval pottery sherd, and other medieval and undatable metal finds were recovered. A. Rogerson (NLA), 22 January 2001. A medieval coin and two flint flakes were recovered. Two medieval coins, two post medieval jettons, an early post medieval hooked tag, and an early post medieval button were recovered. A. Rogerson (NLA), 7 January 2003. Grid Reference corrected from original . M. Horlock (NLA), 25 March 2003. The soilmarks of a series of possible structural components associated with this site may be visible on aerial photographs. However the archaeological nature of these soilmarks is uncertain and it is possible that the marks visible are derived from underlying and non-archaeological natural features. See NHER 50735 for details. S. Massey (NMP), 05 December 2007. A. Beckham (HES), 1 April 2014. --- Photograph: 1999. KSS 24-27, Late Saxon spur. --- Photograph: 1999. KSS 28, Middle Saxon pin head..
--- Photograph: 1999. KSS 29, Middle/Late Saxon strap end..
--- Archive: Clarke, R. R. and NCM Staff. 1933-1973. Norwich Castle Museum Record Card - Late Saxon. Lyng. --- Archive: Clarke, R. R. and NCM Staff. 1933-1973. Norwich Castle Museum Record Card - Medieval. Lyng. --- Photograph: FHN 11-12; GYH 11-14. <S1> Publication: Knowles, D. and Hadcock, R. N. 1971. Medieval Religious Houses of England and Wales. pp 254-255, 260, 266-267. <S2> Serial: Bryant, T.H.. Norfolk Churches. Taverham Hundred.. p.110. <S3> Unpublished Document: Martin, T.. 1772. Church Notes. <S4> Map: Ordnance Survey. 1824-1836. Ordnance Survey First Edition 1 inch..
<S5> Serial: Pevsner, N.. Buildings of England..
<S6> Publication: Hinton, D. A. 1974. Catalogue of the Anglo-Saxon Ornamental Metalwork 700-1100 in the Department of Antiquities, Ashmolean Museum. pp 55-56. <S7> Article in Monograph: Tonnochy, A. B.. 1937. The Censer in the Middle Ages. Journal of the British Archaeological Association, 3rd series, II.. 47-62, 68 and Plate VI. <S8> Illustration: Hoyle, M.. 2000. Drawing of a Middle Saxon copper alloy spur.. Card. 2:1.